Hey lovelies! I realised just how long it's been the other day since I did a fashion-related post, and since my first ever cringy OOTD's from way back in the old days of Just Morgs... it's safe to stay my style has definitely changed. I go through phases with clothes, take Year 7 for example, when my life revolved around ripped skinny jeans, black chokers and pink converse (oh god the cringiest days) and although like everyone my fashion is contantly changing, in the past year I feel like I've found my style a lot more. And much of that is thanks to the topic of this blog post: VINTAGE AND SECOND HAND! Lately I've been in-and-out of thrift stores all the time, and the entire aesthetic of retro and vintage clothes has been my favourite thing - plus the fact that you can find such bargains when buying second hand. 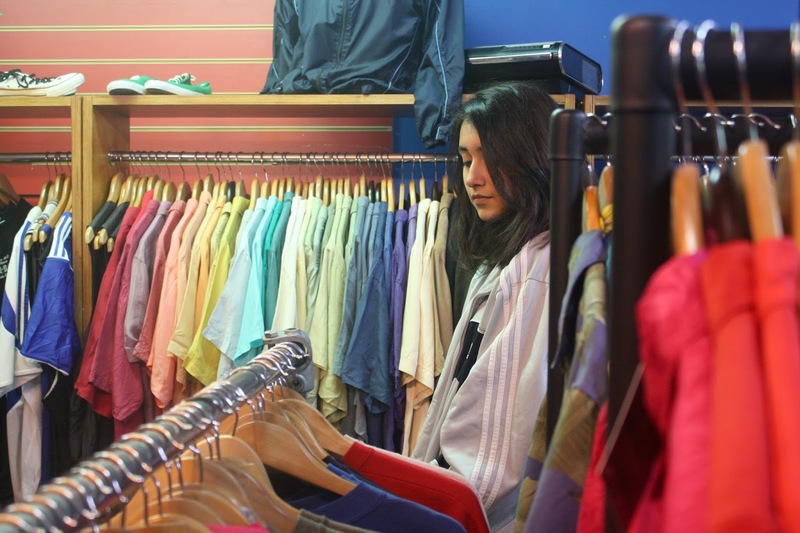 I love the 80's vibes personally that seem to be coming back into fashion at the moment, and so for this post I thought I'd take you with me on a thrift shopping trip my sister and I went on the other day, showing you how I style certain pieces and tips and tricks for buying second-hand. Everything will also be linked at the end, though the annoying thing about vintage clothes is they're mostly one-of-a-kind! One of the things I've been loving lately is the trend of oversized sports jackets or windbreakers that are coming back into fashion at the moment. Because of how light they are, these jackets can be styled on top of anything, and while mine is quite grey/blue neutral toned, the brightly coloured ones can often make up the entire outfit themselves. 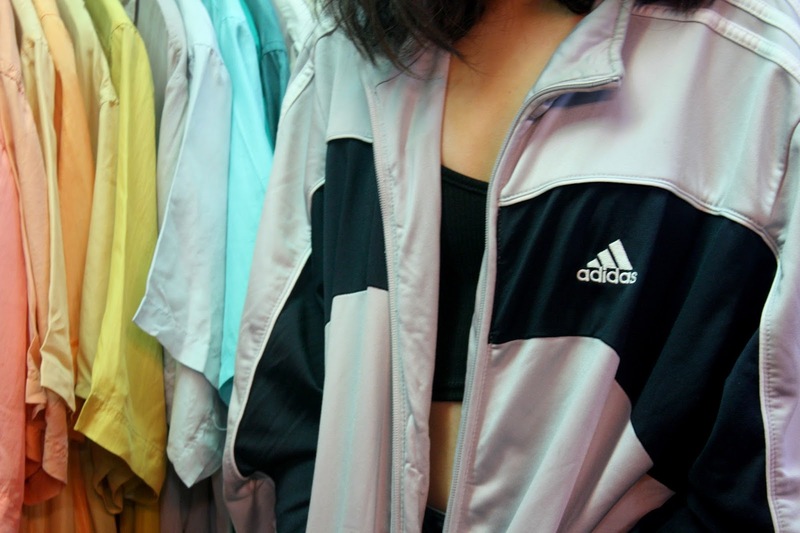 This Adidas one I bought from the 'Renewal Vintage' section of Urban Outfitters, which you should definitely take a look in when you have the chance and it's in perfect condition. Another vintage-themed style I've been loving is Pintripe Trousers. My sister borrowed these from my wardrobe that day (I actually love how we can just share clothes now!) 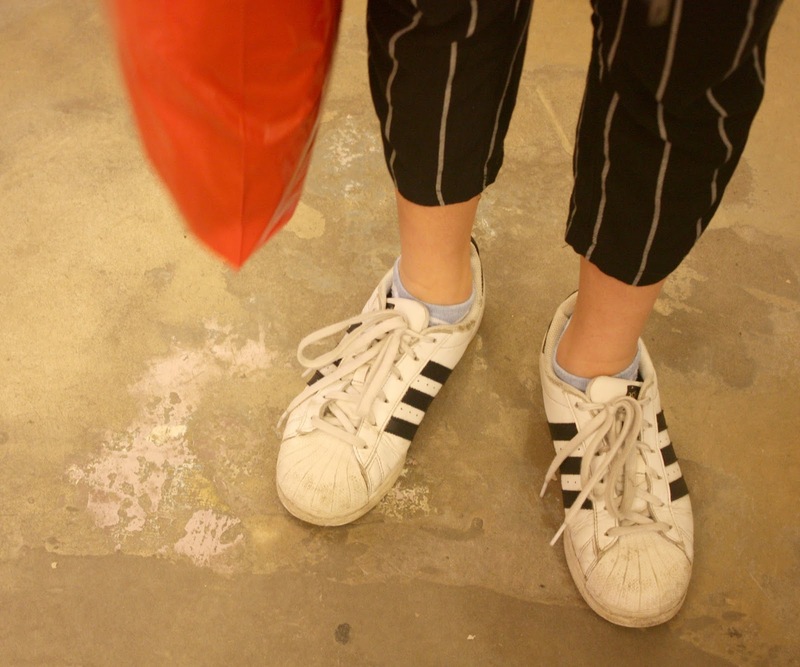 and she styled them really nicely with a black pullover fleece which was also thrifted and black and white superstars. I love pintripe trousers because depending on how you wear them, they can either be done up to look smart and classy or have a casual look. 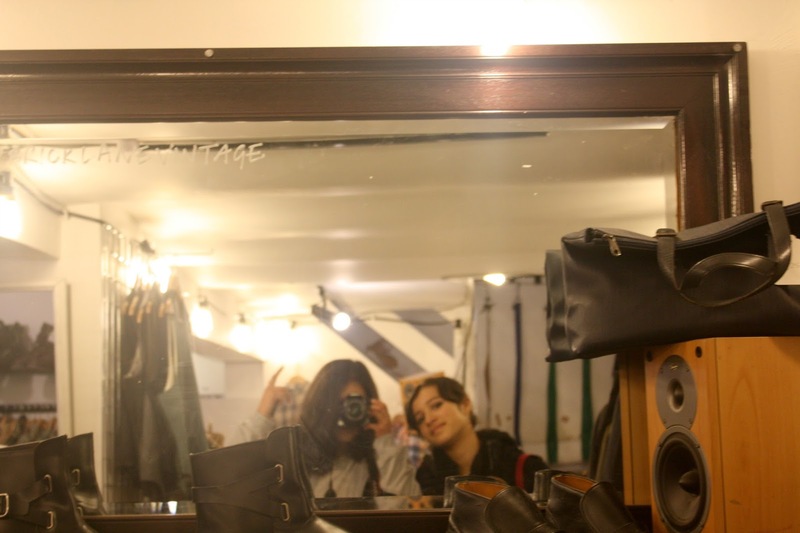 Now these are a bit more difficult to source, because good quality shoes can be quite hard to buy second hand, but a great place to look would be Rokit which has stores all around London. You've seen how Nike 97's are coming back into fashion (I literally see people wearing them everywhere now!) and this vintage theme inspires lots of trends all the time. My sister managed to find a pair of Old Skool Vans in perfect condition on this trip for just £10! In terms of where to shop for vintage and second hand clothes I'd say I'm spoilt living in London! Some of my favourite stores I mentioned in my last post are found in Brick Lane, Camden or Carnaby Street but nowadays it's so easily to shop for vintage-style clothing online too. 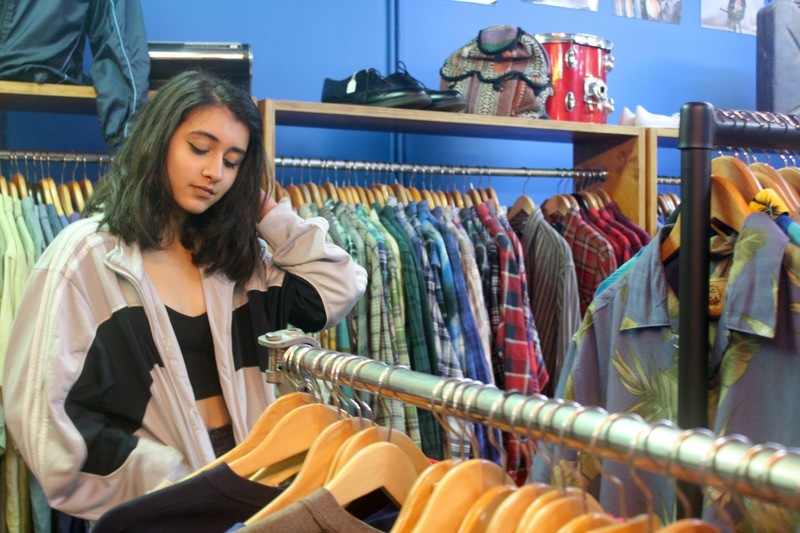 Depop is great for discovering vintage brands and cheaper clothes, and also lots of online stores like Esprit are bringing out amazing ranges of clothes out at the moment that reflect that vintage and retro style. Like the pintripe trousers I mentioned earlier, the website has tons of patterned and quirky new 'Spring Trousers' out right now and I love how online shops like Esprit are incorporating that style into their ranges. 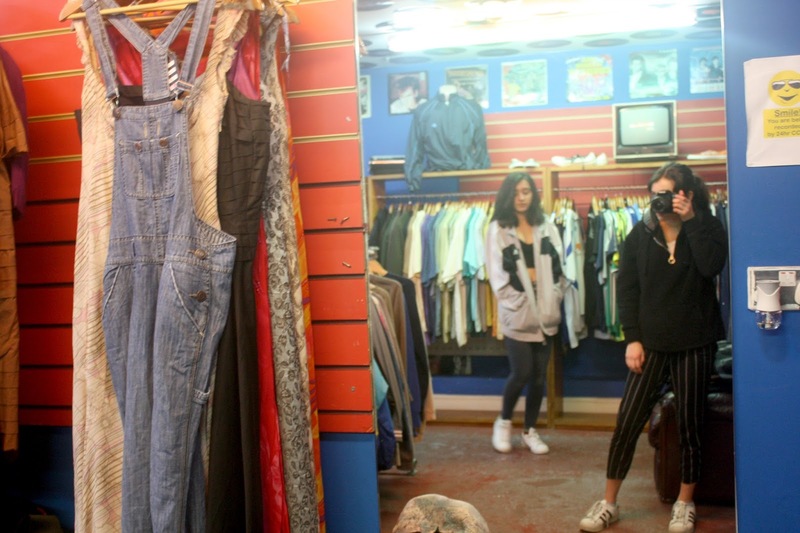 QOTD: EVER TRIED THRIFT SHOPPING? I love the Pintripe Trousers in your photo! I need to buy more second hand – these clothes look really nice. Love your style! 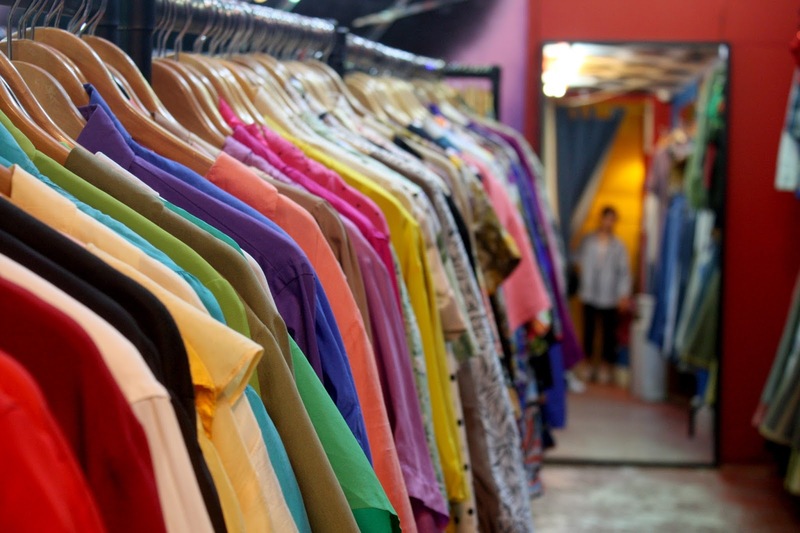 Where I live we have very few options for decent second hand clothing you are so lucky to live in London and be able to find some beautiful pieces. I would def shop more in thrift shops if we had them nearby. I love vintage clothing but I also love high street stuff, so when I can style them both it's a win win! Great post! It's great that you're starting to find your own style! Maybe I should start checking out vintage shops from now on because it's something I've never really done before. I absolutely love thrifting! You should do more posts like this! This post is right down my alley, as a vintage girl! I wear a lot of real vintage clothing, but I also wear reproduction items. Mostly 50s inspired. Absolutely loved this post! The Cutest Red Velvet Cupcakes // Recipe!